I’ve written a little about food and guilt, which is useless and basically self-defeating. This post prescribes a remedy to food related guilt. My approach to nutrition during this pregnancy, or lack thereof, has largely been affected by the drastic changes in our lives over the past several months–pretty much since we found out I was expecting. That being said, we moved cross-country twice in 4 months, and we were camping for several months after that with no furniture/cookware (besides folding chairs, a folding table, a futon mattress, and my Blendtec). I won’t bore you with the details, so long story short, my husband and I are back in Utah and we are settled into an adorable little apartment south of Salt Lake. Fortunately, I was able to manage drinking a green smoothie pretty much every day of this pregnancy, and I ate as many fruits and vegetables as I possibly could. I also ate some junk. Traveling, moving, and lots of eating out for lack of cookware really got the best of me! I survived, and since things have become more settled, I have taken some time to decide on the best nutrition method for our family. Life is unpredictable, and curve balls often times tend to lurk around every corner. The Checklist Approach works great in almost any scenario. There is something about limiting yourself from indulging in cravings, particularly when eating healthfully is woefully inconvenient, that really does make a rebel out of some of us, doesn’t it? When I first got started, my list included one or two things. As I got better, I added things to the list. The idea is to crowd out the bad stuff with the good stuff (when you’re ready.) Try to push yourself, but don’t overdo it. Only put things on there that you know you will eat. 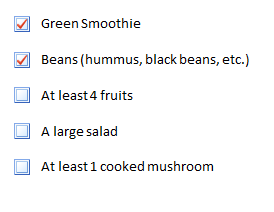 I try to plan my meals to include my list throughout the day, and hopefully I won’t be hungry anymore by the time I’ve eaten what I told myself I would. Produce rarely goes bad in my refrigerator, and my plates are more colorful with nutritious foods. If I want to eat a leftover cupcake from a birthday party, and I have eaten what I planned on already, I might eat it, and I definitely won’t beat myself up over it. Most of the time I’m not hungry by the time I finish my meal and my craving almost always disappears anyway. This method would be great for anyone trying to overcome food related cravings, or anyone who just might want to feel better physically. 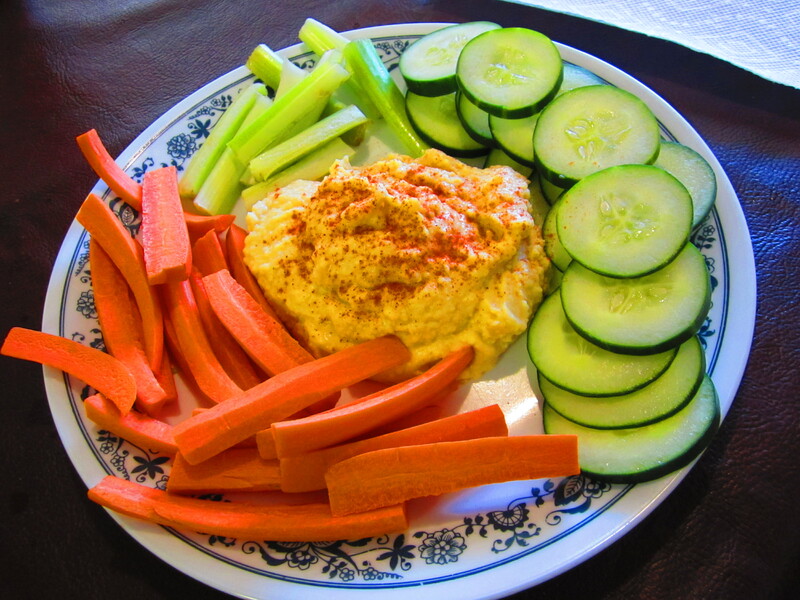 It provides a safe, gradual kick-start into nutritarian eating without all the pressure. What are some foods that you try to eat every day?